Starting tomorrow, YOU can order goodies from the Holiday Mini Catalog. And believe me, there are soooo many good things in there. As a Demonstrator, I was able to place my pre-order on 8/2, which I did. 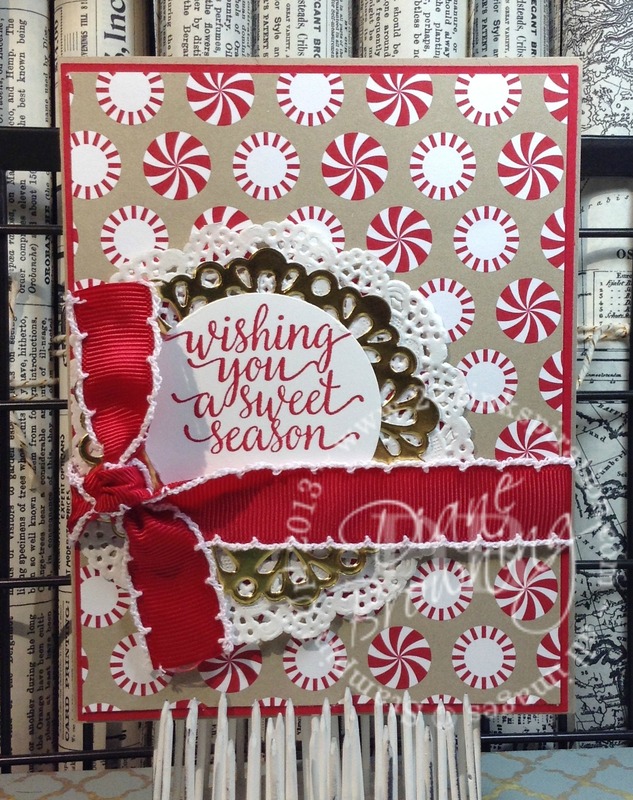 Would you believe it took me all month to break out this beautiful Candy Cane Lane pack of paper? After flipping through it last night, I’m kicking myself for not opening it soon. It is seriously so cute. I love sheet with the itty bitty gingerbread houses – that’s going on my next project. For today, I used the sheet of peppermint candies. The red is a bright Holiday red color. The Holiday Season is my absolute favorite part of the year. We transform our house into a Winter Wonderland, complete with glittery snowflakes hanging from the ceiling. I use a lot of red and white in our Holiday decorating, so these peppermint candies were calling my name. This card isn’t very complicated to make. I cut the Peppermint Paper to 4×5.25″, and the Real Red border is 1/8th” larger on both sides, and the Crumb Cake card base is 4.25×5.5″, which is the standard card size. The Stitched-Edge Ribbon is wrapped around the top two layers and not the Crumb Cake card base. To get the sentiment at the very top of the circle, I stamped first, and punched second so I knew exactly where the placement would be. I’m already making plans for our Holiday decorating this year. Our tree and decorations usually goes up Thanksgiving weekend. The porch gets decorated as early as possible as well. Then around the first weekend in December, we’ll add the snowy tree to the front yard. I live in Southern California so the only way I get a snowy Christmas is if I go buy one at the tree lot. When do you get out your decorations? How soon is too soon? I do try to restrain myself until after Thanksgiving. Today is the last day to get in your order using the August Host Code. The Host Code will change tomorrow on the First. You can still make a purchase in September, just note that the Host Code changes on the First of every month. If you earned Bonus Bucks for a purchase you made in July, TODAY (8/31) is your last day to use them. The Thoughtful Branches stamp set/die Bundle will be retired after today. We have been told that this Bundle will not be available after 9/1. If you were on the fence about purchasing it, this is your last chance. Diane Browning, Independent Stampin' Up! Demonstrator The content of this blog is my sole responsibility as an independent Stampin' Up! demonstrator and the use of, and content of, the classes, services, or products offered on this blog is not endorsed by Stampin' Up!